This page is primarily dedicated to the Warhammer Fantasy RolePlay game, with some secondary bits for Warhammer Fantasy Battle and 40K. Most of the information has been written for the first edition of WFRP, while some material was written for second edition. Third edition was so completely different in terms of mechanics from either of the first two editions, that I did not write for the FFG version of WFRP. 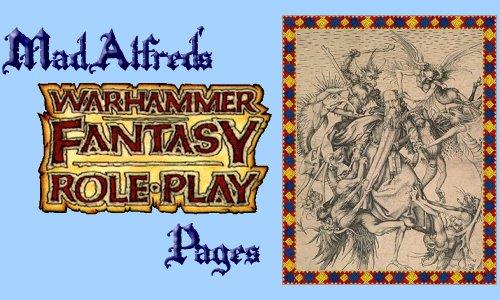 Warhammer Fantasy Roleplay and all associated copyrights, trademarks and registered names are the property of Games Workshop Ltd, and are used without permission. No challenge to their status should be implied from their use. Added gazetteers in the pdf format for the Imperial provinces and the Wasteland in the Maps and Gazetteers page. These gazetteers are updated for 2515 I.C. and include the change in some of the provincial rulers specified in the epilogue of the Empire at War scenario. In addition, revised the Middenland map so as to place Delberz back to its 1st edition location and change the name of Grimminhagen to Grimminhugel since 1st edition had the former settlement located in Nordland. As a result of the work I've done in my 2018-2019 WFRP campaign, I have added maps of the Hundsheimer Wald region of northeast Stirland and the (smallish) town of Marburg to the Maps and Gazetteers page. I have also updated the Stirland and Talabecland gazetteers to reflect the new settlements. A couple of additions to the Hundsheimer Wald map come from Henrik Grönberg's "Zipf and the Leithag March" manuscript, which can be found at the Liber Fanatica Apocrypha page. Updated new version of Hundsheimer Wald map to the Maps and Gazetteer page. Updated Links and Projects pages. This site contains some of the material I've written for WFRP. This page contains the maps I've drawn for the various lands of WFRP and their respective gazetteers. This page contains a list of the scenarios I have written, some of which can be downloaded from this site. While established for Warhammer Battle, there may be some bits of background information which could be used in WFRP. Yes, I know this isn't WFRP, but I didn't want to create another website. So, if you are interested, this page contains the only thing I did for 40K. This page contains the old articles I've wrote and the old maps I've drawn for the various lands of WFRP. Changes to the Warhammer world, generally initiated by GW and some by myself, has prompted me to create this page. If you really are at a loss for something constructive to do, you can go to this section to read the updates to my various WFRP Projects. Unfortunately, there's not much to tell since I don't plan on getting ahead of those for whom I'm working on these projects. This is a list of favorite links for primarily WFRP. There are also a few other Warhammer related sites I recommend. If you are utterly bored and have nothing better to do, this links you to my "WFRP" bio. My thanks to Glen Sharman for the enhancements he provided to this site. Let me know what you think about my page. Send mail by clicking here.